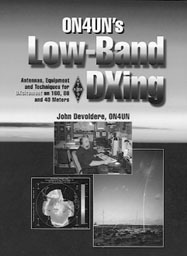 Here is your ticket to low band success. Learn to master 160, 80 and 40 meters. The noted author shares the tips and techniques that can make your station a contest winner. Heavy focus on antenna systems from dipoles to vertical arrays. Huge Third Edition. ©1999 ARRL. Click here to view new edition. Copyright 1999-2005, Universal Radio, Inc.